Have you been trying to lose weight and then BAM!!!! You find out you are PREGNANT! First of all, CONGRATS! Getting pregnant is an amazing miracle each and every time. First, or sixth pregnancy, it is a miracle and a blessing. I was right in the middle of losing weight. I lost 20 pounds in 5 months (gained a couple back with the holidays) all thanks to finally getting my own coy of 21 Day Fix and following the nutrition plan! Then in January, we found out I was pregnant. At 237 pounds. I was so scared, because I worked so hard to lose the weight in the first place, but I did not want to gain all of it back in one month! And I am terrified of gaining too much weight while pregnant. I had to come up with a plan to keep my weight gain slow and steady so that I can have a healthy pregnancy and labor for both me and the baby. If you're overweight, pregnancy can be challenging because you're prone to complications such as gestational diabetes -- especially if you gain too much, have more aches and pains, and that desire to get up and exercise just is on the back burner. But don't fear! 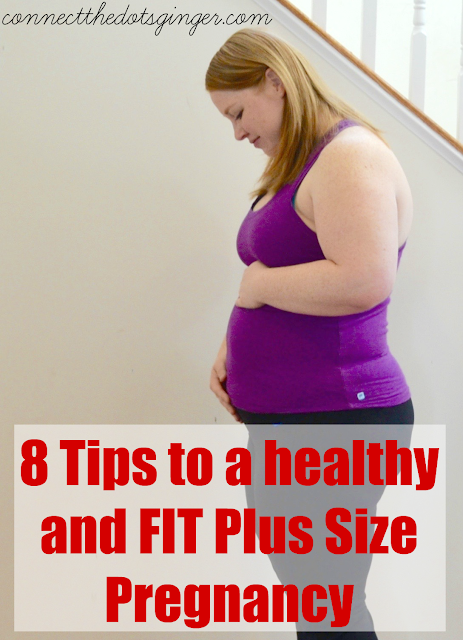 Here are simple and easy ideas to help keep you on track and have a healthy and fit plus size pregnancy. I am currently 16 weeks pregnant and have only gained 4 pounds. And you guys, I EAT! I eat all day long. 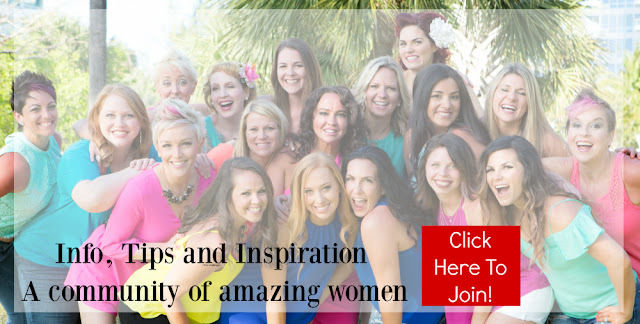 I am just sticking with what I learned in the 21 Day Fix Program, my soulmate program, and following all these tips to keep me as healthy and fit as possible. Stick to breakfast, lunch, dinner, and two snacks. Erratic eating habits or over eating often contribute to weight gain. Gone are the days of eating for two, sorry, but if you listen to that old adage then you will gain way too much while pregnant. Eating healthy, well balanced meals in the right portions is your best bet to keep a steady weight gain during your 9 months! 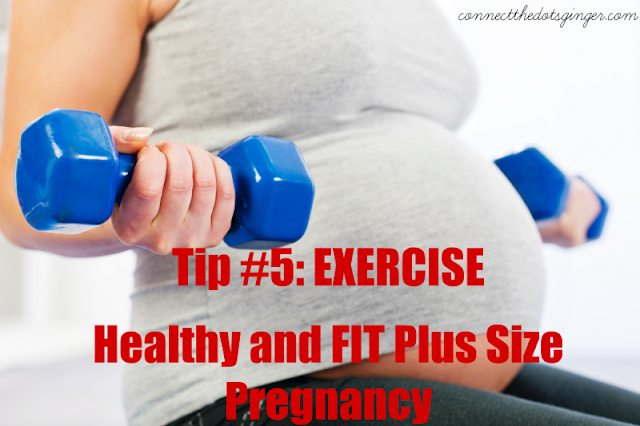 For more you can check out HOW TO CONTROL WEIGHT GAIN WHILE PREGNANT! 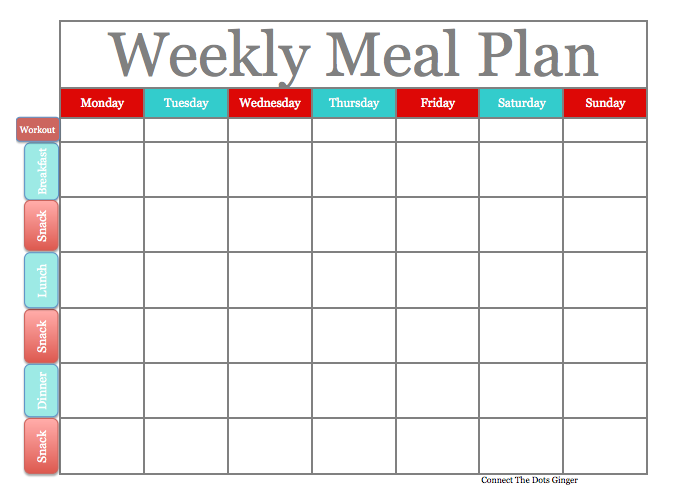 If you are having a hard time with what to eat, or how much you have been eating, keep a food diary to keep track. You can consult the diary, along with your doctor or nutritionist, to see what modifications to make (such as reducing portion size) if you're gaining too much or not gaining enough. This works best so you can actually see what you are eating. Every little nibble or bite, write it down, and be honest about it. These are packed with calories and often times will even taste too sweet while pregnant. (thank you hormones!) You really only need water. I love fruit infused water to keep things interesting. You can drink a glass of milk daily too. But just cut out pop and other over sugared beverages. Save them for date nights, or special occasions. Keep in mind that weight gain doesn't have to start until the second trimester. Then you should gain only two to three pounds a month -- 15 to 20 pounds total. While it is possible to lose weight while pregnant (especially if you have adopted a healthier diet) it is not recommended that you actually "diet" while pregnant. Your body, and baby need the calories to help each other. So no skipping meals or using any diet pills. Always consult your doctor with any supplements you want to add. Choose complex carbohydrates, such as whole-grain breads and cereals, fruits, and vegetables. Just ditch the fast food, and junk food as much as you can. Go for what you know you should be eating no necessary what you want to be eating. In MODERATION you can enjoy sweets and treats but save them for special occasions or date night! Staying hydrated will curb your appetite and help you eat less. Plus it will help you stay healthy. 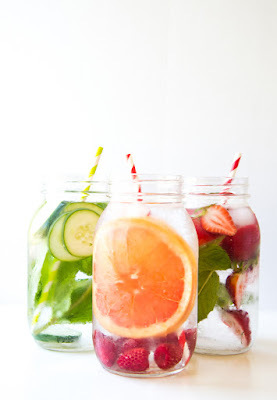 It is so easy, especially over summer months, to get dehydrated. Which can bring on contractions and even early labor. The biggest key is to carry a water bottle around with you wherever you go. If you are out and about, have it with you. Around the house, keep a full cup of water ready for you to drink. 8) Don't Forget To Eat Your Veggies! Eat veggies! Lots of veggies have calcium and even fiber and minerals in them. And it will help to keep your plumbing working best so that you can avoid constipation. Best to keep half your plate full of veggies to make sure you are getting enough. In general, we are not eating enough veggies, raw veggies, or lightly sautéed veggies. A ton of the veggies the US consumes is in the form of fried or just not at all. Chicken and veggie stir-fry is AMAZING and will fill you up. It is one of my pregnancy go to dinner nights! Remember that your body is going to go through changes. As long as you are eating right and exercising your body will do what it needs to do. Remember to LOVE YOUR BODY, or you can click here to learn to love your body. Which can be difficult at times when you see the scale going up. You are doing this for you and your baby. It is worth it! Congrats momma! ----Do you have your Glucose Tolerance Test coming up? Check out my Plus Size Pregnancy Guide To Surviving The Glucose Tolerance Test! Great tips! Even when NOT pregnant! I'm so attached to my water bottle now I feel naked if I don't have it on my person. Lol. Thank you so much for reading! I LOVE IT! YES WATER, WATER, WATER! So important any time, especially as things start to warm up like now! I'm not pregnant yet, but my husband and I are trying. I've lost 30 pounds since January (it is now May) and I've been working so hard to lose the weight. My biggest fear is that I will get pregnant and my hard work will be all for not. Thank you for easing my fears with your lighthearted post with wonderful tips! I feel so much better about this now. Thank you, thank you, thank you! Also, congrats!!! Just read this blog... in the last 5 months I've lost about 20 lbs, I was feeling so good! I'm only 5 weeks pregnant now and I feel it coming back and feel so bloated and lazy! I'm so scared to gain even more weight during this pregnancy, but I'm also so nervous to work out because I had a miscarriage in February. Any advice? CONGRATS ON YOUR NEW PREGNANCY! It is totally normal to feel concerned to exercise early in pregnancy especially after a miscarriage. I worried with every pregnancy. I put a lot of trust in God after my first couple miscarriages that there was nothing I could do to stop a miscarriage and that if the baby was meant to be it would happen regardless of what I did to prevent it from happening. So lots of prayer on that part. As far as bloating and fatigue. Normal in the first trimester. Try going for walks. Just do the amount you can do it gets you out of the house and in fresh air which will help with energy. Make a goal that when the first trimester or morning sickness is done with that you are going to get back into exercising. Decide now what you want to do for your workouts too so you look forward to it and are excited! Make a plan and goals so that even on the days you won't want to exercise you still will because of your goals! You can do this momma! So proud of you! As part of my health plan I decided I wanted to walk in the mornings before breakfast, but there was no way I wanted to get up at the crack of dawn to do it. Great share!! After pregnancy women had to face other situations like stretch marks. These are the problem faced by a majority of women and they are not able to wear the dresses they would like to wear but now everything is so advanced. I love using home remedies for the stretch mark, but takes a lot of time and efforts so I prefer to use dermology stretch mark cream its totally natural and does not takes a lot of time and efforts. And anyone can buy it online. Thanks for sharing the such type of nice and informative content. You have shared some valid points which is helpful for patients. Indeed, even the scarcest change in the face does not go unnoticed – be it weight put on or weight reduction. With losing fats from the body, you likewise lose fats from the cheeks that turn out to be thin. ... Weight reduction can cause your face look excellent, or it can droop. Track your foods and figure out exactly what and how much you are eating. Start with “federal taxable wages” for each income earner in your household. You should find this amount on your pay stub. Multiply federal taxable wages by the number of paychecks you expect in the tax year to estimate your income.